Mallik Wilks in action against Portsmouth. Doncaster Rovers boss Grant McCann insists that the goals will come after his side did everything but score against League One pacesetters Portsmouth. Rovers became the first side to stop Pompey winning in the league this season with a hard-working, energetic display. They dominated the first half but were unable to make it count on the scoresheet - and have now gone three games without scoring. Portsmouth improved after the interval and arguably had the more clear cut chances but were denied by an inspired Marko Marosi in the Rovers goal. Marosi was sent off after 83 minutes when he reacted to Ronan Curtis breaking through on goal by handling outside his area. Having used all three substitutes it caused some late consternation as Ben Whiteman had to finish the game as an emergency goalkeeper but the ten men did well to protect the midfielder and even went close to snatching a late winner. Afterwards, unsurprisingly, the talk was about goals - or lack of them. “And the chances keep dropping to everybody. They’re not just dropping to John Marquis or Alfie May or Mallik Wilks. “At the minute we’re just slicing at it or it’s not quite going for us. It happens like that over the course of a season. Rovers scored eight goals in McCann’s first three games in charge but have failed to find the net in the following three. Portsmouth were the most organised team they have come up against this season, while recent opponents Burton Albion and Shrewsbury Town were happy to sit deep and make life difficult for Doncaster. If anything that is a compliment to Rovers. But it does mean they need to be smarter and cuter in the final third. Against Pompey, and without benched duo Tommy Rowe and James Coppinger until the 73rd minute, they just lacked that incisiveness around the penalty area. Mallik Wilks, who is often the one to get in behind, was strangely subdued, and it is debatable whether either of those wide forward roles suit Alfie May, a goal poacher by trade. Central striker John Marquis is also dropping deep to receive the ball when he needs to be the one in the box whenever Rovers get free down the sides. Paul Taylor was due to start on Saturday only to pick up a knock in training so McCann is still searching for his best front three combination. But the responsibility for goals does not just lie at the strikers’ feet. Andy Butler should have probably hit the target with his first half header from a corner. Rovers need to make more of set piece situations. Whiteman almost did with his curling free kick. The home side were continually being urged to shoot by their fans and it won’t hurt to pull the trigger from distance more often. Perhaps Rovers are slightly guilty of trying to score the ‘perfect goal’. They’ll take one going in off someone’s backside at the moment. Marosi is Rovers’ most-improved player. His save to deny Gareth Evans from Curtis’s cross was sensational, and he followed that up with a very smart double save not long after. His sending off also highlighted another aspect of Rovers’ game which has sharpened up since the arrival of McCann. Nice guys finish last. And Rovers no longer appear as nice or, at times, naive as they were last season. 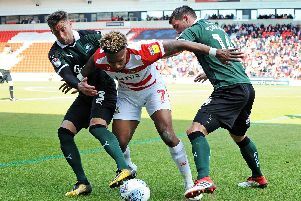 Marosi’s dismissal was Rovers’ first red card since April 2017 when Matty Blair was given his marching orders against Blackpool. He took one for the team and prevented a tap-in for Curtis. There have also been several examples of players taking bookings to prevent the opposition breaking clear. Doncaster have not become a dirty team all of a sudden, but suddenly they look a lot more streetwise.